New Life Health and Wellness was established to meet the growing demand of clients with health issues that were not being resolved through traditional medical interventions. Fara Murata is a Licensed Clinical Social Worker (LCSW) who founded her private practice in 2001. She is also a Functional Nutrition Coach, which makes her a unique expert in treating the whole person. Click here to learn about Fara’s facility, the Rapha Counseling Center. It is hard to overcome any debilitating issue if your body and mind are not healthy. Fara has helped thousands of clients with mental and physical ailments take charge of their health through natural means. Through Functional Nutrition, she understands how food affects your body on a cellular level. By utilizing functional blood labs; food sensitivity testing; saliva, urine and stool testing; and genetics, she can look for root cause issues. This allows a personalized nutritional treatment for each person. 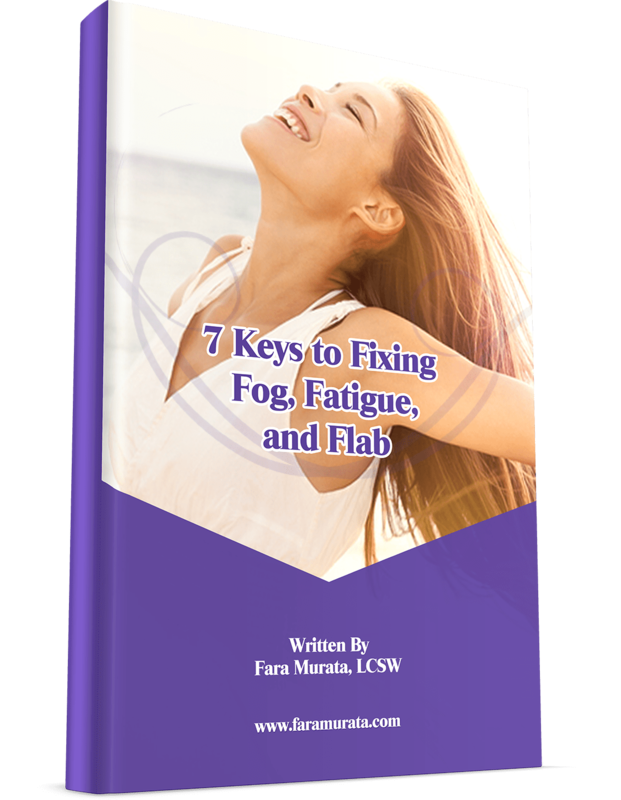 Conditions Fara has helped are anxiety/panic attacks, depression, AD/HD, PTSD, thyroid issues, adrenal fatigue, weight loss difficulty, PCOS, insulin resistance, fatigue, brain fog, autoimmune diseases, digestive issues and more. Click here to find a Program that fits your needs. Each Program is designed to start with a Strategy Session. This includes a thorough mental and physical history, as well as a review of dietary habits, sleep, exercise, stress and coping skills. Your most current blood labs can be reviewed, and if further testing is required, Fara will discuss the details of specific testing recommendations and review pricing. She accepts personal payment only for nutritional lab work, evaluation and supplements. All testing must be paid for prior to ordering. Unfortunately, insurance does not cover the level of advanced testing performed and the depth of the interpretation process. The last thing you want is the same frustrating answers from the same old tests. When possible, you will be referred to your physician for routine blood labs and stool testing to aid in the cost. Why do I need so many tests? Sometimes finding the root cause to a condition takes multiple tests. Fara wants to leave no stone unturned so that you can have vitality and joy back in your life. Once she finds the underlying cause of your condition, she can then implement a treatment that can bring you results when other approaches have fallen short. The work and products used are backed by the latest research. Hundreds of scientific studies are done every year that provide Fara with the knowledge to make the best choices for you. She wants you to get better… faster. The Programs are designed with the most comprehensive, scientific, and objective way to give your body what it needs with specific accuracy. Imagine knowing exactly what you need in order to function well, obtain good sleep, decrease symptoms and pain, and naturally restore your energy so you can return to the things you love most. Most blood work ordered by physicians today is limited to a very basic number of tests because of insurance restrictions. Fara goes beyond these limitations by ordering comprehensive studies and matching those findings with your history, questionnaires and tests to determine the best course of treatment. Follow-up tests may be necessary several months after following the prescribed care to determine your progress. Why aren’t my doctor’s lab tests enough? It’s all about reference range. “Laboratory Normal” leaves so many people unhealthy! Fara uses functional ranges (not just the laboratory ranges) to understand if your health is moving in an unhealthy direction. Every year labs update their “normal” ranges based on the population they’ve tested. As the population gets less healthy, the lab ranges become larger. What was considered normal in the 1970’s was much different from what is considered normal now. It is possible to use cutting-edge nutritional protocols to reverse loss and restore vibrant health. If you are tired of your doctor ignoring your symptoms because you are “in the normal range,” it’s time to try a new way to gain health and wellness.